Clay, or terra cotta, pots have myriad uses. From ancient times to the present, clay pots have been used for cooking. 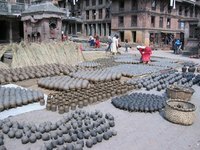 Clay pots with narrow tops have been partially buried in fields and gardens to provide a steady supply of water to plants. Terra cotta pots have been a longtime favorite for decorating, holding house plants, and other uses. Most recently, clay pots have become a crafts medium with limitless ideas. Clay flower pots, unglazed, work well to cook in. Cooks use the pots in their indoor ovens, as well as in outdoor fire pits. Many recipes can easily be found for all types of clay pot cooking. To cook meat or vegetables, soak the clay pot in water for several hours. Put the food in the pot, covering the hole in the bottom with foil. The lid can be a clay saucer or foil. Baking bread in clay pots has become a favorite among cooks and is fun to do with children. For baking, coat the inside of the pot with cooking oil to prevent sticking. Use a medium-to-large clay pot for a barbecue grill. Place wood or charcoal inside the pot. A grill top placed across the top of the pot will provide the surface for cooking. Toads live in flower beds and gardens. Make an easy toad house by turning a clay pot on its side. Cover the pot partially with dirt to keep out heat and provide a dark home for toads. Bury a clay pot almost completely next to a plant or flower that needs a lot of water. For decorative garden lights, fill clay pots with dirt. Poke the stake portion of solar lights into the dirt, one in each pot. Decorate around the light with real or artificial flowers. Place several medium-size clay pots on their sides to make a backyard golf course. All you need to play the game is a stick or club and Ping-Pong balls or plastic golf balls. Or purchase some plastic toy horseshoes. Use clay pots that are a little larger than the horseshoes. Toss the horseshoes inside the pots for points. Also, you can use a large clay pot to hold family games on the patio or in the garage. Plant favorite flowers in a large clay pot to set by your front or back door. Paint a design and a "Welcome" phrase on the pot. Spray the painted areas lightly with clear acrylic paint to preserve. Place a large clay pot and saucer inside, close to the front door. Decorate the pot and saucer as you wish. Guests (or family members) may place umbrellas or backpacks in the pot, and wet or muddy shoes in the saucer. Turn a clay pot upside-down. Paint as desired. Use aluminum craft chime bars to make chimes. Tie on some small or medium cow bells for louder chimes. Or, use several sizes of pots and hang them in a way that they overlap a little, making a chiming sound in a breeze. A dinner bell can be made by tying on an aluminum triangle, such as a child's musical triangle. Hang a metal chime bar, any size, to the triangle to use for clanging the dinner bell. What Sizes Do Clay Pots Come In?